Walking into a dark, isolated room, with only a dim red lamp to help determine where one cage ends and another begins, I can hear rats scurrying in anticipation of their next mealtime. This was my first experience working in an animal lab. We were studying a process called ‘food-entrainment’, which looks at how eating at the same time each day can synchronise physiological processes throughout the body, in ways analogous to how daylight affects sleep–wake behaviours. I saw this work as a way to gain laboratory skills and research experience that would prepare me for postgraduate study of my primary interest – the ageing brain. However, six years later as I am finishing my PhD, I find myself looking back to those very first experiments I did as an undergraduate, and asking whether what we know about food-entrainment in rodents can be translated to help slow the onset of age-related brain disease in humans. Alzheimer’s disease and other dementias are arguably the greatest public health challenge of the 21st century. Although German psychiatrist and neuropathologist Aloysius Alzheimer, first identified Alzheimer’s disease over a hundred years ago, we remain without effective treatments or a cure for this devastating disorder. It is imperative that more funding and research go towards understanding the underlying disease processes at every level of analysis: from genetics and molecular processes to systems and behaviour. We need a cure, and I am confident that we will find one. However, the demographics in society are changing quickly and every day a larger portion of our population is becoming at risk for age-related diseases. Finding ways to promote overall health is arguably just as important as understanding the specific mechanisms of disease. Age-related diseases, such as Alzheimer’s disease, do not develop overnight. Ageing begins at birth and for 60 to 70 years our body’s natural defences are able to ward off disease progression. It appears that once we reach a delicately poised boundary, our repair and clearance mechanisms are no longer able to counteract the damage to our cells. The question is: How can we shift this threshold to postpone when age-related diseases become problematic? Even a relatively small change may delay the onset and spread of these conditions enough to make a big impact on the quality of life of patients and reduce the costs to society. 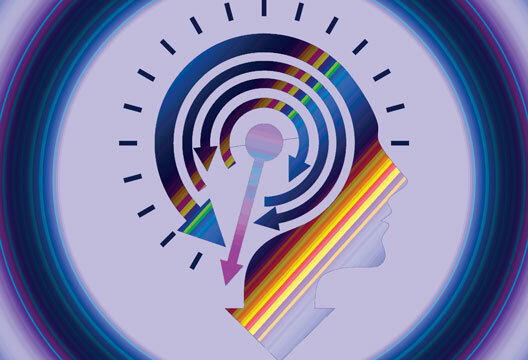 Taking a systems-level approach that considers synchronising circadian rhythms may hold potential for identifying inexpensive and effective interventions for age-related diseases, such as Alzheimer’s disease (Kent, 2014). Alzheimer’s disease pathology is most commonly associated with profound amnesia, but the disease does not affect cognitive processes in isolation. There are widespread effects throughout the body, affecting appetite, sleep patterns, emotional regulation and sense of smell. Some evidence suggests that non-cognitive symptoms, such as involuntary weight loss and sleep disturbances, may even occur prior to the memory and executive functioning deficits (reviewed by Sergi et al., 2013, and Landry & Liu-Ambrose, 2014). Sleep irregularities and restlessness in the evening, referred to as ‘sundowning’, are distressing clinical symptoms suggestive of disruptions in an internal timekeeping mechanism. Circadian rhythms are biological processes that impose a temporal architecture on physiology and behaviour. These rhythms coordinate our internal processes, with daily cycles in the environment. In humans, the suprachiasmatic nucleus (SCN) in the hypothalamus region of the brain is considered the central timekeeper of these rhythms. The SCN is directly entrained (i.e. synchronised) by daylight and regulates the timing of other internal rhythms, which is why it is often referred to as the ‘master pacemaker’. When the body’s internally generated rhythms are not synchronised with external daily cycles (such as when suffering from jet-lag or working a nightshift), sleep disturbances, fatigue and cognitive deficits are common and illustrate the strong influence SCN timekeeping has on the body. These symptoms are also experienced by the elderly and Alzheimer’s patients because of sporadic sleeping patterns. The loss of normal circadian behaviour is associated with increased morbidity and mortality in both humans and animal models (Froy, 2011), emphasising the importance of maintaining rhythmicity. Sleep disturbances in Alzheimer’s disease have a negative impact on daytime functioning of the patient, as well as the well-being of the caregivers, and are a major contributing factor for placement of Alzheimer’s patients in residential care homes (Bianchetti et al., 1995). Light therapy is often used to improve quality of sleep for Alzheimer’s patients, in an attempt to enhance circadian rhythmicity and re-establish synchrony among rhythms throughout the body. This therapy may also provide an alerting effect that can help sustain daytime waking to stimulate activity, raise body temperature and increase eating. Even though light is considered the dominant environmental stimulus for synchronising circadian rhythms, for many processes the timing of food intake is just as important and can affect rhythms downstream of the SCN (reviewed by Patton & Mistlberger, 2013). Daily feeding can entrain (i.e. synchronise) free-running rhythms by acting directly on the SCN or by acting on the anatomically separate but unidentified ‘food-entrainable oscillator’ to synchronise rhythms even if the SCN is damaged. Some hypothesise that with age the SCN stops functioning optimally, and this master pacemaker is no longer able to coordinate physiological processes. In this case, food-entrainment could be used to reverse the age-related dampening of rhythms. In a mouse model of Huntington’s disease, food-entrainment was successfully used to synchronise rhythms, and restore daily behavioural cycles and metabolic abnormalities (Maywood et al., 2010). Another possibility is that the SCN keeps ticking along unaffected by age, but that other oscillators throughout the body, governing important physiological processes, become uncoupled from the central rhythm. A recent study using a Drosophila model of Alzheimer’s disease showed progressive circadian deficits analogous to those experienced by patients, but demonstrated that the sporadic sleep–wake behaviours were not due to an arrhythmic internal timekeeping mechanism (Chen et al., 2014). If translatable to humans, it would suggest that the SCN remains intact and functioning in patients with Alzheimer’s disease, but that other rhythms become out of sync. Uncoupled rhythms would mean that physiological processes may be occurring at suboptimal times. For example, sleep–wake behaviours could be misaligned with cycles of body temperature, or hunger may no longer coincide with peak digestive functioning. If the SCN is intact but no longer in sync with other rhythms, it may be possible to use scheduled mealtimes to bring physiological processes back into synchrony. Studying the mechanisms underlying food-entrainment could also lead to pharmacological discoveries that mimic the effects of food on our circadian system. For example, ghrelin or another feeding-related neuropeptide, may be a putative candidate for a food-related entraining signal. Ghrelin is an important stomach hormone controlling appetite. Circulating ghrelin levels rise sharply before main meals and decrease once fed. It may be possible that this spike could send a feedback signal to the SCN and be a mechanism for synchronising rhythms. Ghrelin receptors are present on SCN cells (Zigman et al., 2006), and when applied directly to the SCN can alter the phase of the circadian rhythms in mice and hamsters (Yannelli et al., 2007). Additionally, over the past 10 years there has been accumulating evidence that in addition to regulating hunger, ghrelin has direct effects on learning and memory processes, is neuroprotective, and may have beneficial effects on Alzheimer’s disease pathology in mouse models (Carlini et al., 2010; Diano et al., 2006; Moon et al., 2011). In humans, there is an age-related decline in circulating ghrelin levels (Rigamonti et al., 2002), which is correlated with cognitive decline in non-demented elderly (Spitznagel et el., 2010). There is also some evidence showing that Alzheimer’s patients have reduced local brain production of ghrelin (Gahete et al., 2010), suggesting that a decline in ghrelin may be a contributing factor to symptoms. It is possible that appropriately timed administration of ghrelin could be a method for synchronising internal rhythms, while also providing cognitive benefits for Alzheimer’s patients (Kent, 2014). Finding ways to slow the onset of Alzheimer’s disease and other age-related neurodegenerative diseases, undoubtedly requires collaboration and an interdisciplinary approach. Studying circadian rhythm disruption in Alzheimer’s disease holds great promise for inexpensive interventions. If the uncoupling of biological rhythms partly underlies age-related disease progression, then preventing rhythms from becoming uncoupled may promote overall health and help our body’s natural defences against age-related pathologies. Harmonious interaction of internal and environmental rhythms ensures that physiological processes occur at optimal times. If scientists and doctors look for early cues of internal rhythms becoming uncoupled, we may be able to use a combination of light therapy, scheduled mealtimes, and other interventions to slow down the progression of disease. I am excited to see whether my very first experiments studying the daily activity patterns of those scurrying rats will provide useful insights for developing effective Alzheimer’s disease treatments. Bianchetti, A, Scuratti, A., Zanetti, O. et al. (1995). Predictors of mortality and institutionalization in Alzheimer disease patients 1 year after discharge from an Alzheimer dementia unit. Dementia, 6, 108–112. Carlini, V.P., Ghersi, M., Schioth, H.B. & Barioglio, S.R. (2010). Ghrelin and memory. Peptides, 31, 1190–1193. Chen, K-F., Possidente, B., Lomas, D.A. & Crowther, D.C. (2014). The central molecular clock is robust in the face of behavioural arrhythmia in a Drosophila model of Alzheimer’s disease. Disease Models & Mechanisms, 7(4), 445–458. Diano, S., Farr, S.A., Benoit, S.C. et al. (2006). Ghrelin controls hippocampal spine synapse density and memory performance. Nature Neuroscience, 9(3), 381–388. Froy, O. (2011). Circadian rhythms, aging, and life span in mammals. Physiology, 26, 225–235. Gahete, M.D., Rubio, A., Cordoba-Chacon, J. et al. (2010). Expression of the ghrelin and neurotensin systems is altered in the temporal lobe of Alzheimer’s disease patients. Journal of Alzheimer’s Disease, 22(3), 819–828. Maywood, E.S., Fraenkel, E., McAllister, C.J. et al. (2010). Disruption of peripheral circadian timekeeping in a mouse model of Huntington’s disease and its restoration by temporally scheduled feeding. Journal of Neuroscience, 30, 10199–10204. Moon, M., Choi, J.G., Nam, D.W. et al. (2011). Ghrelin ameliorates cognitive dysfunction and neurodegeneration in intrahippocampal amyloid-β 1-42 oligomer-injected mice. Journal of Alzheimer’s Disease, 23, 147–159. Rigamonti, A.E., Pincelli, A.I., Corra, B. et al. (2002). Plasma ghrelin concentrations in elderly subjects: Comparison with anorexic and obese patients. Journal of Endocrinology, 175, R1–R5. Sergi, G., Rui, M.D., Coin, A. et al. (2013). Weight loss and Alzheimer’s disease. Proceedings of the Nutrition Society, 72, 160–165. Spitznagel, M.B., Benitez, A., Updegaff, J., et al. (2010). Serum ghrelin is inversely associated with cognitive function in a sample of non-demented elderly. Psychiatry and Clinical Neurosciences, 64, 608–611. Yannelli, P.C., Molyneux, P.C., Harrington, M.E. & Golombek, D.A. (2007). Ghrelin effects on the circadian system of mice. Journal of Neuroscience, 27, 2890–2895. Zigman, J.M., Jones, J.E., Lee, C.E. et al. (2006). Expression of ghrelin receptor mRNA in the rat and the mouse brain. Journal of Comparative Neurology, 494, 528–548.